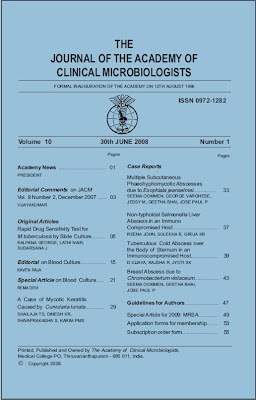 The journal of the Academy of clinical Microbiologists was started in the year 1997 by Dr.Mabel Legori FRCPath, MD, when she was Professor and Head of Microbology at Govt. Medical College, Thiruvananthapuram. Since then, two issues have been published every year. From 2013 onwards, JACM has gone online with Medknow as publishers. This has resulted in an unprecedented increase in expenses which cannot be met without advertisements. The journal is given free to all life members and associate members. For indexing there should be no break in the issues every year. Since it is imperative that the existence of the journal is not jeopardised and the present efforts for indexing should continue, it has been decided by the Editorial team that the print copy has to be charged at a nominal rate. The journal is available freely online to all members. This decision has been accepted by the President, Secretary and the Academic Council. This will be ratified at the next GB of the Academy on 4th August 2017. 3. For new life members, 4 consecutive issues , i.e. print copies of journal issues that come out after they became member, will be complimentary. After that they will have to pay yearly. a. Rs 2000/- as author fees will cover one issue of the journal. b. If author is member and pays member fee of Rs 1000/- he/she will get two issues of the year in addition to the author copy. c. If a co-author wants a print copy, Rs 500/- to be given before May 20th for June issue and before November 20th for December issue. d. One complimentary issue will be given to all co-authors of the Special Article if they are not members. This tariff has to be transferred by NEFT to the Academy of Clinical Microbiologists,Journal account at the Dhanalaksmi Bank, Medical College, Thrissur. Your full address with pincode is essential for proper delivery of the journal issue. Scope: The Journal of Academy of Clinical Microbiologists is to be published twice a year to promote publication of original communication in all aspects contributing to the advancement of knowledge in Clinical Microbiology. findings will be given priority. Those who wish to contribute review articles may write to the Editor as the reviews are usually written on invitation. All manuscripts submitted for publication are subjected to scrutiny by Editorial board and are accepted subject to editorial changes.